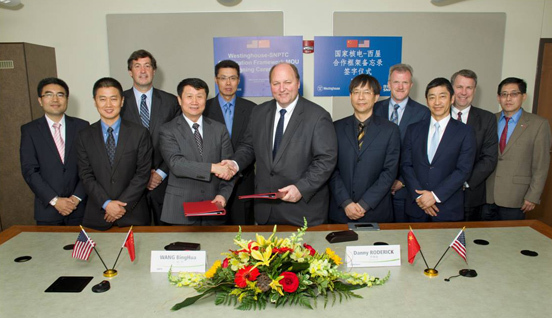 News_SNPTC-WEC Nuclear Power Technical Services (Beijing) Co,. Ltd.
SWSC, SNPTC-WEC Nuclear Power Technical Services (Beijing) Co., Ltd.
SWSC is a very important reflection of a good cooperation relationship between SNPTC and WEC. June 16, Chairman Wang Binghua signed the Cooperation Framework Memorandum with President of Westinghouse Electric Roderick. SNPTC and Westinghouse Electric will make further cooperation in the R&D and application of nuclear power technology, construction management and equipment supply chain, etc. SNPTC is bringing in the 3rd generation nuclear power technology and making new innovations. Adhering to the principle of long term cooperation with the original creator of AP1000 technology, the company has established solid cooperation with Westinghouse Electric in the R&D of nuclear power technology, key materials production and supply chain management. The signing of the memorandum will further expand the range of cooperation between the two companies, improve the service capability for AP1000 and CAP 1400 customers, and build a mutual benefit and win-win cooperation. Offer the employee a career rather than just a job. If you have any comments or question, please click here.